Nicole: It’s chilly and rainy and I haven’t eaten breakfast yet. I think it’s time for some oatmeal! Renee: Oatmeal Brulée! Oatmeal on the bottom of an oven-safe dish (ramekin), layer of sliced bananas, layer of chopped pecans, a little brown sugar and into the broiler ’till the sugar caramelizes. VOILA! Heaven. It sounded so good to me that I went into the kitchen and did exactly what she suggested. It was a perfect rainy day breakfast and so delicious that I just had to share it with the rest of you! 1. Bring water to boil in a medium saucepan (or large saucepan if making several servings at once). Stir in oats and salt, if using, and immediately reduce heat to low. Watch carefully, because the water might foam up and boil over. (If using an electric stove, and the water foams up before the burner cools down enough, briefly lift the pan off the heat and the foam will subside.) Simmer uncovered over low heat, stirring occasionally, for 25-30 minutes or until oats are of desired texture. 2. Remove oatmeal from heat and stir in milk and butter. Pour oatmeal into a small casserole dish (about 1 1/2 quarts) and arrange banana slices over the top. Sprinkle brown sugar evenly over the top of the bananas. Put casserole under a preheated broiler until sugar starts to melt (watch carefully, it happens pretty fast). Remove from oven and sprinkle with chopped pecans. * Serve warm. Recipe Notes: *When I made this the first time, I put the pecans on before broiling it and found that they started burning before the sugar was melted. From now on, I’ll just sprinkle it with toasted pecans after it comes out of the oven. You don’t have to use steel cut oatmeal, that’s just what I prefer. Feel free to start with four servings of any type of oatmeal. 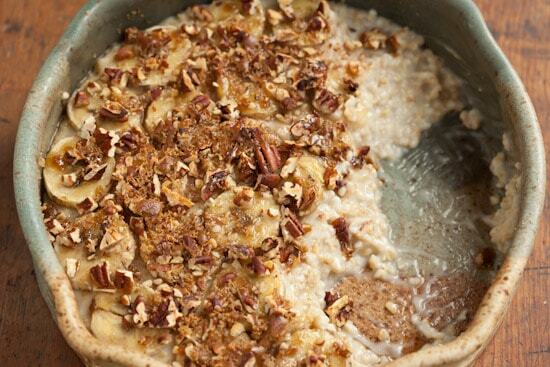 Are you new to using Steel Cut Oats? Check out my earlier post on Steel Cut Oatmeal. Want to chat with me about what you like to eat for breakfast? Follow Pinch My Salt on Facebook. 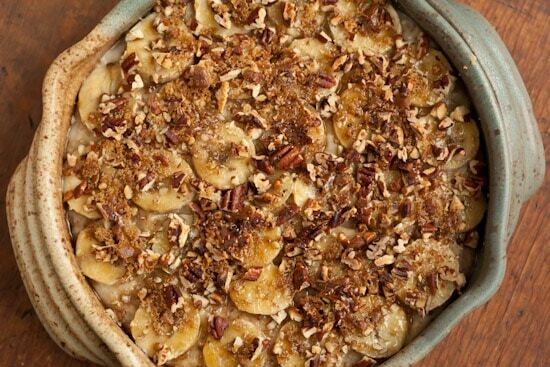 I'm not a huge fan of either bananas or oatmeal, but this looks AMAZING. Seriously. Making this for breakfast tomorrow. Yum! This looks AMAZING!!! Seriously I wish so much that I could have milk! Maybe I will try and make this with almond milk! What a comforting breakfast. I was a huge oatmeal fan as a kid... so this is right up my alley. Great post! You're blowing my mind. Seriously. Nicole - Lovely! Will try tomorrow. Where did you get the great ramekins? Yumm! My honey loves oatmeal and bananas! He would love this! My bff loves brulee, and I'm pretty sure she would love this too. I'm pretty sure you just changed my life with this recipe. Just so you know. There are some folks who would just die and go to Heaven if they ate this for breakfast. Or lunch. Or dinner! What a great idea for oatmeal! I love oatmeal but sometimes grow tired of its sameness. I love steel cut oats and cannot wait to try this twist! Wow what a grownup version of breakfast oatmeal. But I bet kids would love it,too. Oh my gosh, that first photo is gorgeous. This sounds delicious and looks beautiful. I'd never have thought of brulee-ing my breakfast, but I love it! Sounds delish and looks amazing! This sounds AWESOME. I can't cook with real sugar for another two months (have gestational diabetes), but I think this may work with brown sugar splenda. And I'm so gonna rock it out with real sugar come two months from now. Thanks for the inspiration! Toasty pecans, warm banana and brown sugar...such a great combination! This oatmeal brulee is inspiring. I don't have steel cut, just regular old fashioned oatmeal. Is it still 4 cups water to 1 cup oats? It seems like a large ratio and I don't want the dish to be soupy. Can you recommend? Melissa: Just follow the directions on your package of oatmeal and make enough for four servings. Regular oatmeal should work just fine! I used regular oats and added a half a cup of all natural peanut butter melted to the oats. So delicious!